The Crew are big fans of the beach, so it was with great excitement that we headed down to Newquay, perhaps the nation’s most popular surfing destination. But we weren’t there to enjoy the swell. 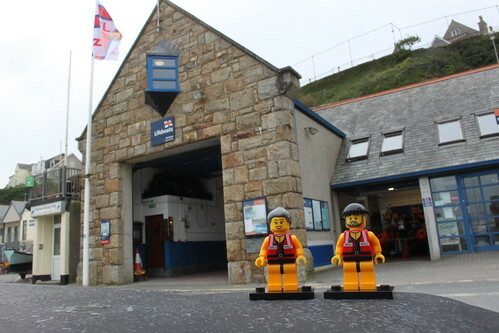 Instead of heading for famous Fistral Beach, we wandered our way down to the small working harbour, home of the town’s small fishing fleet – and its lifeboat station. What awaited us on the beach was, however, in no way small. Because standing majestically on the sand, like a steam-punk leviathan left stranded by the receding tide, was the largest tractor the little guys had ever seen. And behind it was the carriage for the station’s Atlantic 85 inshore lifeboat, which was out on exercise with its crew. 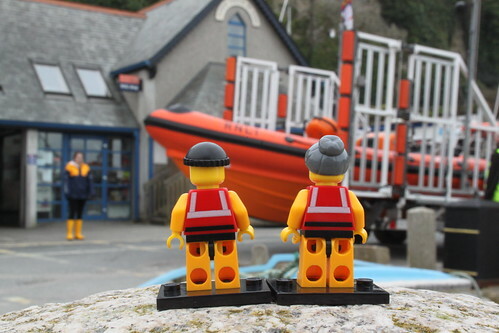 With the lifeboat due back at any time, the little guys popped into the station to say hello to the shore crew, who were enjoying a brief respite between launch and recovery of the boat. 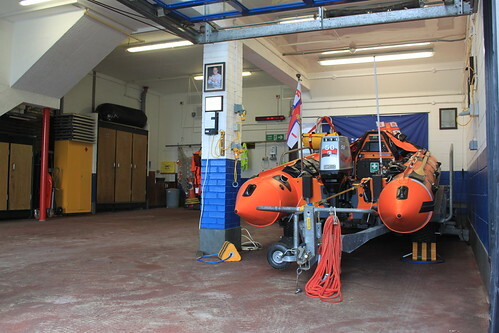 They also had a quick look around the station itself, which was built in 1994 to house the station’s two lifeboats. Interestingly, the station building also houses the local Seaman’s Mission, as the previous Mission building was demolished to make way for the lifeboat station complex. 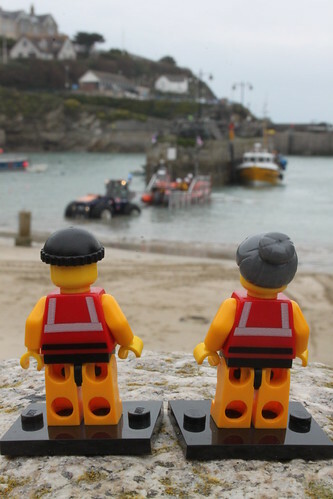 The Newquay lifeboat station has two inshore lifeboats, the Atlantic 85 inshore lifeboat ‘Gladys Mildred’ and the smaller D class lifeboat ‘Valerie Wilson’. With the Atlantic out on exercise, the D class looked a little lonely on her own in the boathouse. But with the doors open, she was attracting plenty of interest. Not least from the Crew. A shout from the shore crew, now bundling out of the boathouse in wellies and day-glow vests, alerted us to the fact that the Atlantic was on its way back into the harbour. 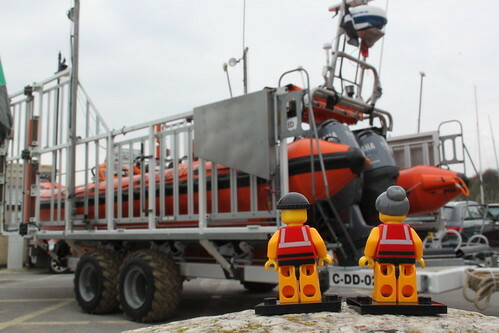 The little guys took up a prime position on the sea wall, keen to get a good view of the boat’s recovery. The ‘Gladys Mildred’ soon appeared through the harbour entrance and the helm reversed her deftly into the waiting carriage, which the tractor had pushed deep into the water. The crew made what must, in fact, be a rather tricky ‘reverse parking’ manoeuvre look incredibly easy. The benefit, no doubt, of repeated practice in all sorts of weather conditions. 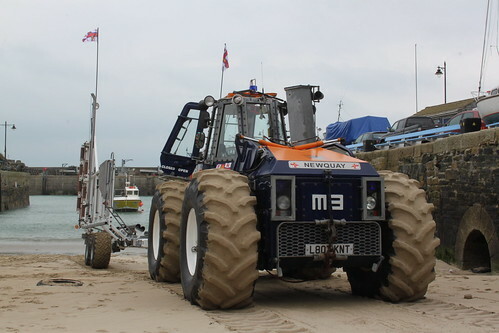 The enormous tractor then pulled the carriage out of the water and headed along the beach towards the boathouse. 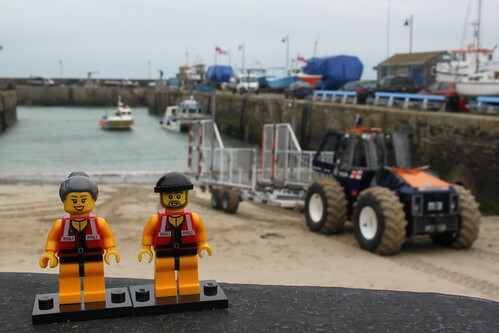 The rest of the shore crew, meanwhile, kept a look out for passing pedestrians and vehicles, ensuring that the lifeboat could be wheeled safely up the slipway. With the boat parked in front of the boathouse, the Crew were able to have a close look at the Atlantic 85 and her two 115 horsepower outboard engines. Unlike the smaller Atlantic 75, the 85 is also equipped with radar (the circular white-and-blue thing perched atop the frame above the engines), allowing the crew to operate more effectively in reduced visibility. With the boat, carriage and tractor now covered in seawater and sand, it was time for everything to get a good clean. 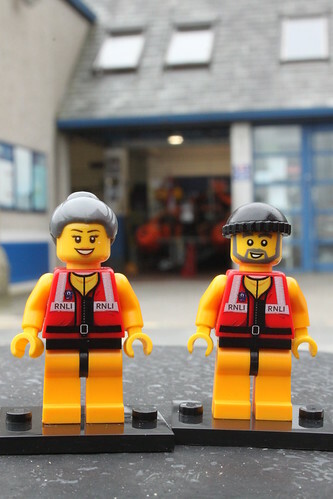 As the little guys know from their home station of Portishead, washing everything down with fresh water is a critical part of maintaining the kit and ensuring that it is always ready for service. 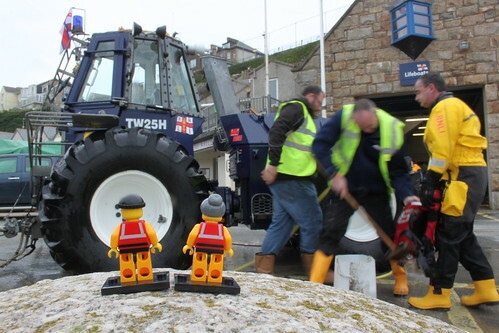 Even the crew’s personal protective equipment got a good wash.
As the shore crew manoeuvered the Atlantic back into the boathouse, the little guys said their goodbyes and, with a last glance at the station’s gargantuan tractor, headed on their way. (This time to Fistral Beach…) A big ‘thank you’ to Andy, the station’s volunteer press officer, and to the rest of the crew, for inviting us along and for making us so welcome. 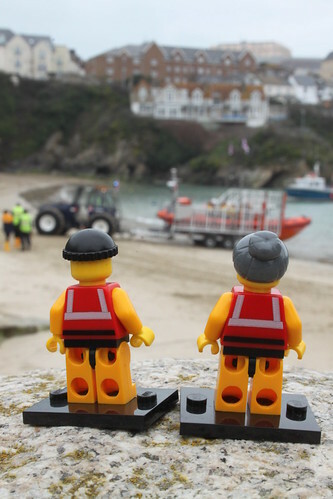 This entry was posted in Out and about and tagged Lifeboats, Newquay, RNLI, The Lifeboat Crew by Simon Perks. Bookmark the permalink.